All ceremonies will be held at the Watsco Center at the University of Miami on the Coral Gables campus. No tickets are required for guests. All ceremonies are approximately 2 hours. Commencement is held twice a year at the University of Miami in December and May. There are no graduation fees and all candidates will be provided with regalia for the ceremony. Graduates may bring as many family and friends as they wish. No tickets or parking passes are needed for guests of any UM Commencement ceremonies. The Fall Commencement Ceremony held in December is intended for students completing their degree requirements in the fall semester. 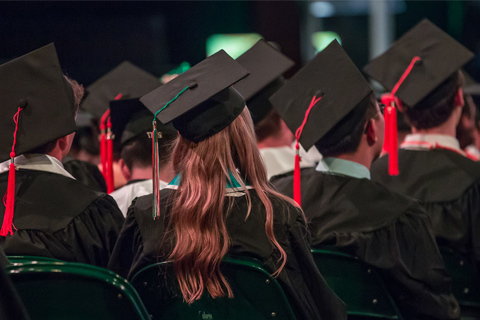 The Spring Commencement Ceremonies held in May are intended for students completing their degree requirements during the current spring or upcoming summer semester*. If you are unable to participate in Commencement during the appropriate semester due to other obligations and would like to walk at an earlier or later date, please contact the Office of Commencement directly at commencement@miami.edu or (305) 284-1824 for further instruction and to order your cap and gown. *Please note there is NO summer commencement ceremony. Summer graduates should walk in the Spring Ceremony in May prior to degree completion, and apply to graduate via CaneLink during the spring semester. Commencement is the celebration of your culmination as a University of Miami student. The awarding of degrees and honors to the candidates named in this program is contingent upon the satisfactory completion of the appropriate requirements by each candidate. Participating in commencement in no way implies or ensures graduation, or the award of honors. For more information regarding eligibility and degree requirements, contact your academic advisor or the Office of the Registrar at (305) 284-2294 or on their website. Graduating students should arrive in their regalia at the Fieldhouse adjacent to the Watsco Center no later than one hour prior to their ceremony start time and follow the signs to the Graduate Lineup Site (at the Fieldhouse). Doors open for guests at the commencement one hour prior to the ceremony. The Academic Procession of candidates will enter the Watsco Center commencement site 15 minutes prior to the start time of your ceremony. Graduates must lineup on time. Late graduates may not be allowed to walk. Commencement ceremonies are approximately two hours, including processions of candidates, an address by the commencement speaker, and presentation of the degrees. Each graduate will be called individually to receive the diploma and be congratulated by President Frenk on stage. Professional photographers and videographers will capture the memories! The Academic Procession consists of candidates, participating faculty, and alumni representatives and will be led by the Grand Marshal. Note: The academic procession will enter the commencement site fifteen minutes prior to the published start time of the ceremony for the graduate and undergraduate degree ceremonies. The President’s Procession, which includes the President, Provost, Trustees, and other stage party members, will follow the Academic Procession. The President’s Procession will enter the site promptly at the scheduled starting time, and the audience should rise and remain standing until the ceremony is declared open. The program will begin with the National Anthem followed by an introduction by the Provost and welcome address from the President. Faculty are the heart of a great institution. Retiring faculty may be recognized for their dedication to our students at commencement. Additional honors may be awarded to outstanding members of the UM community or the commencement speaker. The commencement speaker will then offer advice to the graduates. The Provost will introduce the Dean who will present the candidates to President Frenk. The Dean will ask all candidates to rise for the conferral of their degrees. Following conferral, the graduates will come forward to the stage to be recognized by name and congratulated by the President and Dean. The Frost School of Music Commencement Band will lead the singing of the Alma Mater at the conclusions of the ceremony. The words will be displayed on the screen. The Grand Marshal will lead the recessional, followed by the stage party, faculty and graduates. Guests should remain seated until the recession has concluded.